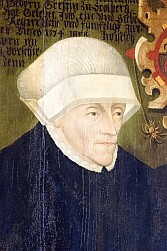 Although the Abbess of Quedinburg, shown in this picture lived in medieval times, she had the right to sit and vote at national assemblies in Medieval Germany. Centuries later most European women were still not allowed that basic right. Meanwhile, in North America, Marie Guyart, a French nun wrote in 1645 that women of the Iroquois tribe could serve as chieftains and vote in councils. Why was it that women in countries that today we would call “the developed countries” had to struggle so long to get the vote? Many of the reasons for opposing suffrage for women were more about money and property than about individual rights. 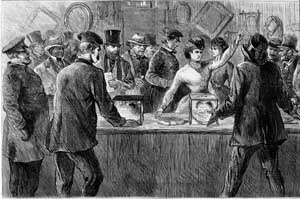 During much of the 19th century married women could not own property, so they would not be eligible to vote in many countries. There were some suggestions that spinsters and windows who did have property might vote, but that would anger all the men who were not allowed to cast a ballot. Even in 2014, male voters are considered more reliable defenders of property rights while women have a deplorable tendency to vote for social programs. Fox news commentators in recent weeks have been quoted as saying that women shouldn’t be allowed to vote—a feeling that is surely held by many enthusiastic Republicans. We usually talk about votes for women as a purely individual, social benefit, but feelings about it are just as often motivated by economic interests as social ones. As a matter of outward form the defendant was asked if she had anything to say why the sentence of the court should not be pronounced upon her. Anthony’s arguments may impress us in 2014, but they did not help to change the law. It was more than forty years later that women in the United States were given the right to vote. You might think that with all the effort that went into gaining the right to vote, women would flock to the polls but that hasn’t always happened. Voter turnout is still a major issue in the United States, where fewer citizens vote than in many other countries. According to the Center for American Women and Politics, in 2012, during an important presidential election, only 63.7% of eligible women and 59.8% of eligible men reported that they had voted. What can we expect in a non-presidential year like 2014? The Abbess of Quedinburg and the Iroquois chieftains of earlier centuries would look on in wonder if they knew how carelessly we treat voting. As for poor Susan B. Anthony, she must be weeping for the failures of her example to inspire us today. Still makes my blood boil thinking about this. And the fact that there are many 21st century countries–primarily in the Middle East and Africa–where women may technically have the right to vote but still have little or no control over their own destinies. You are so right! Voting is important, but being able to control our own lives and destinies is just as important for all women. SO TRUE! I have been trying to promote voting among my students (college students who are all old enough to vote) and I’m deeply saddened by how indifferent most of them seem to the prospect. Yes, voting is a right but that doesn’t mean we should take it for granted. It is a precious right that we should cherish and exercise as much as possible.